Prepare the pizza dough as directed and roll out into a free form shape, be it round, oblong, rectangular, etc. Combine the melted butter with the minced garlic and parsley. Add salt to taste. Drizzle or spread the mixture with a pastry brush (or back of a spoon) over the tops of the crusts. Bake in the oven for 5 minutes and remove from oven. Top the crusts with alfredo sauce, enough to lightly cover. 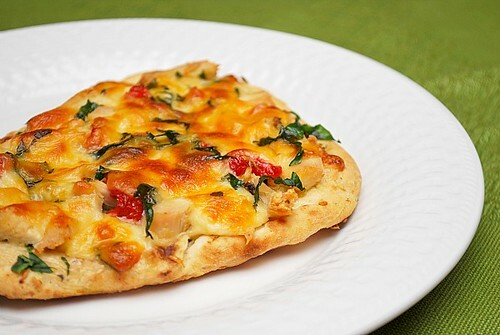 Sprinkle the chicken, red peppers, and spinach over the crusts. Finish off with a sprinkling of mozzarella. Return to the oven and bake for 10-12 minutes until cheese is melted or to your desired doneness. Joelen, this looks super good! I haven't tried it at OG either, but now I want to make it at home!! It sure looks better than anything at OG. I recently re created their Zuppa Toscana which is the only thing I'll eat there other than salad. This looks so yummy! I had most of the stuff at home, so I made it tonight with some slight tweaks! Its in the oven now! Wow, this looks incredible!!! It really looks like the perfect Sunday lunch dish...and given that tomorrow is Sunday...and I have no lunch plans...I think I know what I'm making now! I just made this, MY GOD'S IT'S AMAZING!